Mortgage markets worsened slightly in last week’s holiday-shortened week. As expected, Wall Street took its cues from Europe and from the U.S. jobs market, and mortgage rates moved across a wide range. Home buyers throughout Northeast Florida and would-be refinancing households were greeted with wildly varying mortgage rates, depending on which day they loan-shopped. According to Freddie Mac’s weekly mortgage rate survey, 30-year fixed rate mortgage rates averaged 3.55% nationwide last week, with an accompanying 0.7 discount points. That is, until Thursday’s meeting of the European Central Bank. The ECB is similar to the Federal Reserve in that, among its primary functions, it provides liquidity to banking systems in times of crisis. Thursday, the European Central Bank intervened with force. To aid Spain and Italy, the third- and fourth-largest Eurozone economies, the European Central Board launched a bond-buying program meant to reduce speculation that the two nations — and the Euro itself — would fail. The move calmed investors and sparked a broad equities market rally. U.S. mortgage rates did not fare so well, however, climbing as much as 0.25% and leaving that “Freddie Mac mortgage rate” in the dust. If you tried to lock a loan Thursday, you may have been greeted with a rate nearing 4.000 percent. Fortunately, those rising rates were short-lived. Friday morning, the U.S. Bureau of Labor Statistics released its August Non-Farm Payrolls report and mortgage rates dropped. Far fewer jobs were created in the U.S. than was expected. 96,000 net new jobs were made in July. Wall Street had expected 130,000. 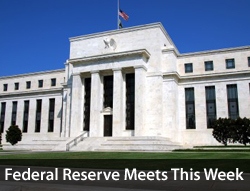 This increases the likelihood of new Fed-led stimulus — perhaps as soon as this week. The Federal Open Market Committee meets for the 6th of eight times this year later this week; a 2-day get-together scheduled for September 12-13. The Fed may announce a new round of market stimulus. If it does, mortgage rates should fall. If it doesn’t, mortgage rates may rise. Other news affecting potential housing payments this week includes the release of key inflation data Thursday and Friday, and Friday’s Retail Sales data.